Maintaining a healthy looking, yet safe tree is an important plant health care challenge for homeowners. Although trees are strong and durable, they are susceptible to physical injury such as that caused by ice and windstorms, as well as lawnmower and other mechanical wounds. When trees are wounded, the newly uncovered tissue is exposed to canker pathogens and decay microorganisms that infect the tree. The latter microorganisms digest tissues that are responsible for nutrient and water translocation (phloem and xylem) or structural support (heartwood), resulting in unhealthy, unsightly, or unsafe trees. Despite these limitations, at times homeowners need to prune (and thus wound) trees to maintain aesthetic characteristics, remove diseased or dead limbs, or improve structural stability. Proper approaches to pruning and wound treatment can go a long way to minimize the issues mentioned above. These approaches are based on an understanding of tree biology and the wound healing process. Figure 1. A pruning wound showing callus growth (photograph by N. Kleczewski). Trees attempt to close wounds naturally by forming callus tissue (Fig. 1). Callus formation rates vary for different tree species and are affected by environmental conditions such as nutrient and water availability. Some trees may never completely close their wounds, depending on these and other factors, like wound size. However, numerous studies demonstrate that favoring callus formation can significantly reduce infection and colonization by decay organisms and other pathogens. There are several ways that callus formation rates can be enhanced, or at least not inhibited. First, it is essential to avoid limiting oxygen availability to the wounded tissues. Oxygen is necessary for the proper healing process to take place. It thus follows that painting a wound with any kind of material that interferes or impedes oxygen access will delay or even prevent wound closure by callus formation. Thus wound painting is no longer recommended, with one exception: in areas where oak wilt disease occurs, wound paints may be useful in preventing insect spread of the oak wilt fungal pathogen. Second, trees that are planted in well-drained, quality soils, with good texture, structure, and containing adequate levels of organic matter, grow in a physiologically more balanced fashion that favors the healing process. Thus, when planting trees, homeowners should be aware of soil effects on tree growth and take measures to improve soil quality, for example, by applying adequate amounts of good composted mulch. In rare cases of extreme soil nutrient deficiency, homeowners may wish to apply mineral fertilizers for rapid, reliable growth responses, including callus growth. However, before fertilization is even applied, care should be taken to ensure that proper application rates are used so that issues associated with over-fertilization, such as burning of roots, are avoided. Furthermore, if fertilizers are over utilized, tree growth rates may be excessively rapid, which may lead to lowered structural stability as well as increased susceptibility to pathogens and pests. Trees are pruned for a variety of reasons, for example, to develop proper canopy shape or remove potentially hazardous limbs. Although the optimal time for pruning varies by region and tree species, the best time to prune many trees is when rates of growth, and therefore callus formation, are the greatest. In Ohio, this means that pruning should take place in the spring to early summer (March–June), although hazardous tree limbs should be removed regardless of the time of year to minimize the risks of injury and damage. There are some caveats to these basic recommendations depending upon the type of tree. Examples include pruning for optimal fruit production and problems for some tree species with any pruning in winter months due to increased chance of winter freeze injury. If significant pruning is necessary, homeowners should check with their local professional garden center, Extension service, or certified arborist for advice. Which Branches Should I Prune? Figure 2. 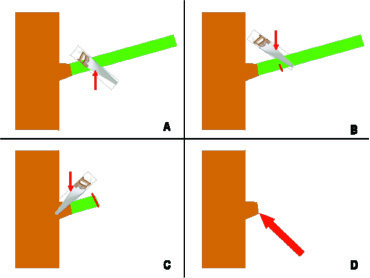 Examples of branch angles and their relative levels of structural strength. Branches approaching 90-degree from the trunk are the strongest, while those at acute angles from the trunk are structurally weak and are good candidates for pruning (diagram by N. Kleczewski). Main branches emerge from the trunk at various angles. The strongest branches are those that are placed at near 90-degree angles with the main trunk (Fig. 2). Oftentimes branches form at very acute angles that are nearly parallel to the trunk. Such branches are structurally weak and may need to be removed. Crossed, diseased, dead, or broken limbs should also be removed in the context of a proper tree care program. If a tree has obvious severe decay, the local certified arborist should be called to assess the situation and determine if the tree needs to be removed altogether. Although pruning is necessary to develop strong, attractive trees, if done improperly more damage than benefit can be the result. If dealing with a large limb (for example, greater than 3 inches in diameter at the intersection with the trunk), the first cut should be positioned about one foot away from the intersection with the trunk. The cut should proceed from the underside of the limb up to about 1/3 of its diameter (Fig. 3A). The final cut can then proceed from the top of the branch to reach the bottom notch and allow the branch to fall freely (Fig. 3B). Failure to proceed in this manner, for example, by cutting directly from the top and all the way down, could cause the branch to tear under its own weight in an unpredictable and potentially dangerous manner. The remaining stub (Fig. 3C) should be removed until the cut is flush with the branch collar (Fig. 3D). Shoulders or other projections associated with the crotch should not be removed, as this will increase the size of the wound and the amount of time needed for callus to close the wound. Smaller branches may be removed with sharp pruning shears flush with the collar, while sharp saws and other pruning tools must be used for larger limbs. Sharp implements that produce a clean cut will result in faster callus formation and healing. As always in cases where sharp tools are used, and especially with power tools like chainsaws, proper personal protection should be donned and caution should be exercised, especially with limbs larger than 3 inches in diameter. Figure 3. The stepwise progression of removal of a large limb. First, make a cut approximately 1/3 through the limb diameter from the underside. This cut should be placed about one foot away from the trunk (A). Next, proceed with a cut from the top, being careful that the limb does not fall on any valuable property, people, etc. (B). The remaining portion of the branch (the stub) should be removed flush with the branch collar (C and D, arrow). Always remember to use caution, proper equipment, and safe practices when pruning trees (diagram by N. Kleczewski). Of course, prevention of wounds is the best practice in the first place. There are many ways that homeowners can prevent wounding and decay of urban trees. First, trees should be planted in proper locations, with adequate space relative to other trees or obstacles. For example, trees should be located sufficiently far enough from buildings, sidewalks, driveways, and power lines. Furthermore, ensuring that a tree is planted properly and in a high-quality, well-drained soil will go a long way to minimize wound healing problems. If the site has poor soil, that soil should be amended with composted mulch to improve conditions for the root system and the tree overall. Mulching trees also discourages activity involving lawnmowers and weedwackers, which are common agents of damage at the base of the trunk, since mulched areas are not meant to grow grass. The most important thing to remember with urban trees is that, although they are beautiful and valuable to homeowners on many levels, they also can pose serious risks if they are not properly maintained. Whenever homeowners have serious questions regarding the stability or health status of the trees in their yards, it is advisable to consult a professional before attempting any action, particularly with larger trees. This can easily be achieved by contacting local horticulture experts, like university Extension educators or certified arborists.